You know what the secret to a delicious salad is? (Haven't you always wanted to know the answer to that burning question?) Adding something sweet. I know that kind of defeats the purpose of a healthy salad, but try it - everything will taste better. Can I point out how popular spinach salad with raspberry vinaigrette was in the 90s? Exactly. Now I am not calling for sugar but a little honey in the vinaigrette didn't hurt anyone. What about adding fruit into your salad? Yeah? Neah? I think it is a complete yeah - especially with all of the delicious stone fruit that is coming into season. Combine that with some creamy and dreamy burrata and you are in salad heaven. This stone fruit salad with burrata will make you completely forget that you are actually eating something healthy. I know that is a big claim but try it and I promise you will love it. Salads don't have to be only vegetables. Adding fruit to the salad or the vinaigrette by mashing it in there, is a great way to vary flavor and texture. It all goes back to the savory and sweet idea that I love in food. If you take something that is very savory like a salad and add just a hint of sweetness, it completely rounds out the flavors and makes you want to eat the whole thing. And lots of burrata doesn't hurt either. So, since I am in love with all the amazing stone fruit at the farmer's market, I thought it would be a great accent to a salad. Paired with some creamy burrata, savory red onion and meaty pistachios, you will truly be in salad heaven. 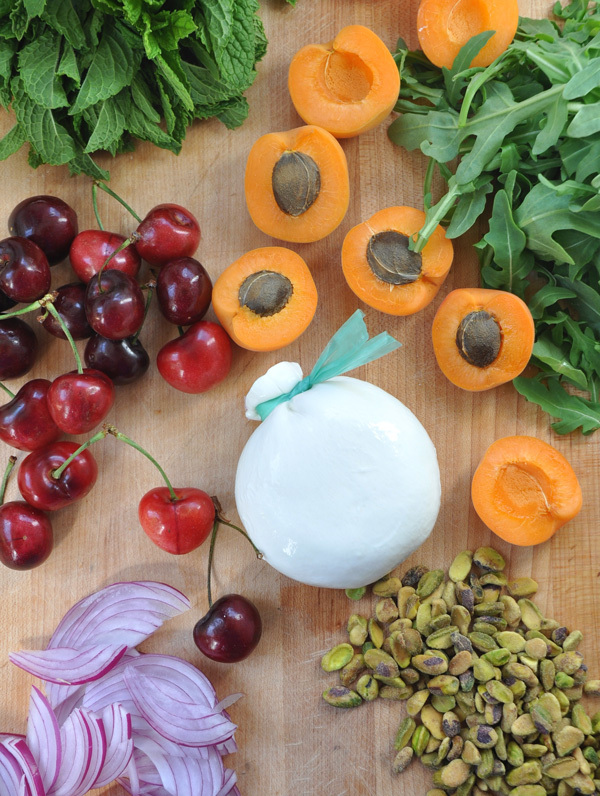 In a large bowl, combine salad greens, red onion, apricots, cherries, buratta and pistachios. In another bowl make dressing by combining honey, vinegar, salt and olive oil. Toss salad well with dressing, sprinkle with chopped mint and taste for salt and pepper.